* Senior club appearances and goals counted for the domestic league only and correct as of 23:10, 19 April 2016 (UTC). Toumani Diagouraga (born 10 June 1987) is a French professional footballer of Malian descent who plays as a defensive midfielder for English club Leeds United. He began his career at Watford and signed for Hereford United and Peterborough United before joining Brentford. He has been described as a midfielder who "can keep the shape and pick up the second ball". Diagouraga was born in Paris to Malian parents and was spotted by a Watford scout, subsequently joining the Hornets' Academy in December 2003. He signed professional terms in November 2004 at age 17 and starred in the youth team's run to the quarter finals of the 2004–05 FA Youth Cup. His performances in the run attracted transfer interest from Premier League side Chelsea. Diagouraga received his maiden call-up to the first team for the first game of the 2005–06 season, when he was an unused substitute for a 2–1 Championship defeat at home to Preston North End. Diagouraga made his first team debut with a start in Watford's 2–1 League Cup second round victory over Wolverhampton Wanderers on 20 September 2005. He was substituted after 75 minutes by Junior Osborne. Diagouraga again started in the third round against Wigan Athletic, but was brought off for Ben Gill after 85 minutes of a 3–0 extra time defeat. He made his league debut in December, receiving a start and being substituted for Jay DeMerit at half time of a 4–1 defeat to Burnley. Diagouraga made four appearances during the 2005–06 season. Following Watford's promotion to the Premier League, Diagouraga failed to be called into a league squad during the 2006–07 season and instead featured in two cup ties. He spent the entire 2007–08 season out on loan and departed the Hornets at the end of the season after his contract expired. Diagouraga made only six appearances and scored no goals during his four years with the club as a professional. Diagouraga signed on loan for League One side Swindon Town on 23 March 2006 until the end of the 2005–06 season. He made his debut in a 2–0 win over Chesterfield on 25 March, replacing Michael Pook at half time and putting in a performance which drew comparisons to Patrick Vieira. He made eight appearances for the club and returned to Watford at the end of the season. Diagouraga joined League One club Rotherham United on loan on 12 January 2007, on a deal running until the end of the 2006–07 season. The terms of the deal saw him arrive at Millmoor as a makeweight in a £1,000,000 deal that took Millers players Will Hoskins and Lee Williamson to Watford. Diagouraga made only seven appearances for the Millers. Diagouraga joined League Two side Hereford United on 10 August 2007, on a loan that was later extended until the end of the season. He scored the first senior goal of his career in a 4–2 win over Bradford City on 22 September and scored again in a 1–1 draw at Chester City on 12 October. He made 50 appearances during the 2007–08 season, scored two goals and celebrated promotion to League One at the end of the campaign, after the Bulls secured a third-place finish in League Two. Diagouraga signed for Hereford permanently on 7 July 2008, signing a three-year contract. He was a regular starter and scored his first goal of the 2008–09 season in a 2–2 draw at home to Tranmere Rovers on 26 December 2008. He levelled the score at 1–1 in a league match with Crewe Alexandra on 7 March 2009, but his strike was cancelled out by Billy Jones' winner. He was again a virtual ever-present, making 48 appearances and scoring two goals as the Bulls were relegated straight back to League Two after a bottom-place finish. He departed Edgar Street in June 2009. Across his two spells at the club, Diagouraga made 98 appearances and scored four goals. Diagouraga signed for Championship side Peterborough United on a four-year contract for an undisclosed fee (believed to be in the region of £200,000) on 17 June 2009. He was an ever-present through the first half of the 2009–10 season and featured in Posh's run to the League Cup fourth round, where they were knocked out by Premier League side Blackburn Rovers. Diagouraga made what would be his last Peterborough appearance in a 0–0 draw with Ipswich Town on 8 December. Following that appearance, he fell behind new loan signings Jake Livermore and Josh Simpson in the pecking order and found himself relegated to the bench, which led to his departure on loan for the rest of the season in January 2010. He departed the club on 17 July 2010, having made 23 appearances and scored no goals. Diagouraga joined League One side Brentford on a one-month loan on 21 January 2010 and the deal was later extended to the end of the season. He went straight into the starting lineup for Brentford's league match at Norwich City two days later, being brought off for Carl Cort after 59 minutes of the 1–0 defeat. Diagouraga quickly established himself as a regular starter and laid on goals for Charlie MacDonald and Myles Weston in a 4–0 drubbing of Gillingham on 6 February. He made 20 appearances during the second half of the 2009–10 season as Brentford consolidated their position in League One. Diagouraga signed for Brentford on a three-year contract in July 2010. He began the 2010–11 season as a starting central midfielder alongside Marcus Bean and featured in Brentford's run to the fourth round of the League Cup, starting in victories over Championship side Hull City and Premier League Everton in the second and third rounds. Diagouraga scored his first Brentford goal in a 2–1 home win over Charlton Athletic on 2 October. Two games later, he found himself dropped to the bench and did not return to a regular starting role until teammate Nicky Forster replaced Andy Scott as manager in February 2011. With the Bees, Diagouraga reached the first cup final of his career, but ended up on the losing side and was sent off for two bookable offences in a 1–0 defeat to Carlisle United in the 2011 Football League Trophy Final at Wembley Stadium. He made 43 appearances during the 2010–11 season and scored one goal. Diagouraga suffered a knee injury in a 2011–12 pre-season friendly versus Hampton & Richmond Borough in July 2011, which ruled him out for two months. He returned to first team action with a fifteen-minute cameo at the end of a 2–0 away victory over Oldham Athletic on 24 September. He made his first start of the season in a Football League Trophy second round tie away to Charlton Athletic on 5 October. He scored his first goal of the season in the 3–0 victory and twice assisted four-goal hero Mike Grella in a 6–0 win over Bournemouth in the following round. Diagouraga made it two goals in two games with a late equaliser in a 2–2 draw at Carlisle United on 8 October. Diagouraga enjoyed a successful 2011–12 season, making 40 appearances and scoring a season-best five goals. Diagouraga was a virtual ever-present during the 2012–13 season, making 49 appearances and scoring one goal, which came in a 2–1 win over Notts County on 29 March 2013. He signed a new two-year contract in February 2013. Diagouraga was denied promotion to the Championship due to a missed penalty from Marcello Trotta in the final game of the season versus Doncaster Rovers and defeat to Yeovil Town in the 2013 League One Playoff Final. Now behind Adam Forshaw, George Saville and Alan McCormack in the midfield pecking order, Diagouraga featured mostly from the bench during the early stages of the 2013–14 season, before making a run of starts in late September and early October, after which he returned to the bench. He received an assurance over his future from new manager Mark Warburton in January 2014, but departed on loan the following month. Diagouraga joined League Two side Portsmouth on a month's loan on 17 February 2014. He made his debut in a 5–1 defeat to Scunthorpe United on 22 February, playing the full 90 minutes. After three appearances and receiving "good reports", Brentford manager Mark Warburton put a block on Diagouraga's loan being extended beyond March 16. In a U-turn, it was reported on March 12 that Diagouraga's loan was expected to be extended, with a 24-hour recall clause inserted into the deal. Diagouraga was named by manager Richie Barker as captain for the final game of his initial loan, skippering a 3–1 defeat to Fleetwood Town on 15 March. After the match, Diagouraga reiterated his desire to stay at Fratton Park and his loan was extended until the end of the 2013–14 season on 17 March. He was recalled by Brentford on 26 March after making eight appearances. Diagouraga made his return to the team on 29 March, coming on as a 75th-minute substitute for Nico Yennaris in a 0–0 draw with Oldham Athletic. He made regular appearances through to the end of the season and celebrated automatic promotion to the Championship after a 1–0 victory over Preston North End on 18 April. He made 26 appearances during the 2013–14 season. Diagouraga found himself behind Marcos Tébar and Alan McCormack in the midfield pecking order in the early months of the 2014–15 season, but he forced his way into the starting lineup in November after being challenged by Mark Warburton to earn a new contract. On 9 December, Diagouraga signed a new contract which will keep him at Griffin Park until June 2017. He celebrated his 200th Brentford appearance versus Leeds United at Elland Road on 7 February 2015, assisting Alex Pritchard for the only goal of the game. 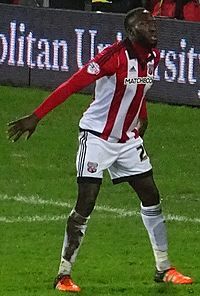 On 3 May, Diagouraga was announced as the winner of the Brentford Supporters’ Player of the Year and Bees Travel Club Player of the Year awards. He made 43 appearances during the 2014–15 season, which ended after the Bees fell to Middlesbrough in the playoff semi-finals. Despite featuring as an ever-present in league matches during the first half of the 2015–16 season, on 11 January 2016 Diagouraga handed in a transfer request, Diagouraga was linked with a move to Rangers F.C. to join up with his former Manager Mark Warburton. Diagouraga departed Griffin Park on 25 January 2016. He made 246 appearances and scored seven goals during six years with the club. On 25 January 2016, Diagouraga signed for Championship side Leeds United on a two-and-a-half year deal for an undisclosed fee. He was given the number 19 shirt He made his debut on 26 January 2016 in the 1–1 draw with his old club Brentford. He scored his first goal for Leeds in the 2–1 victory over Bolton in the fourth round of the FA Cup on 30 January. On 19 April 2016, Diagouraga scored his first league goal for Leeds against Wolverhampton Wanderers in a 2-1 win. He scored for the 2nd game running on the following fixture on 19 April in a 3-2 victory against Reading. On 5 August 2016, Diagouraga was allocated the number 4 squad shirt for the 2016/17 season. On 7 August, Diagouraga started for Leeds in the opening fixture against Q.P.R. in a 3-0 defeat, However after the heavy defeat Diagouraga was dropped from following Leeds squads. As of match played 23 January 2016. ^ a b c Hugman, Barry J. (ed) (2008). The PFA Footballers' Who's Who 2008–09. Mainstream. ISBN 978-1-84596-324-8. ^ Tom Moore (17 April 2015). "Brentford boss lauds Diagouraga and co over improvement this season". getwestlondon. Retrieved 14 June 2015. ^ "Blind, Stupid and Desperate – Watford FC site – 04/05 – Injuries and suspensions". Bsad.org. Retrieved 2014-03-03. ^ Matthews, Anthony (2005-03-18). "Young Hornets' cup dream dies (From Watford Observer)". Watfordobserver.co.uk. Retrieved 2014-03-03. ^ "Blues trail Hornets starlet | Chelsea News, Transfers, Fixtures, Scores | Sky Sports Football". Skysports.com. Retrieved 2014-03-03. ^ "Toumani Diagouraga Player Profile – ESPN FC". www.espnfc.com. Retrieved 2015-07-07. ^ a b c d e f "Toumani Diagouraga | Football Stats | Brentford | Season 2005/2006". Soccer Base. Retrieved 2014-03-03. ^ "Gamecast: Burnley v Watford – English League Championship". Espn Fc. 2005-12-17. Retrieved 2014-03-03. ^ "Diagouraga eyes move | Football News". Sky Sports. Retrieved 2014-03-03. ^ a b c "Toumani Diagouraga | Football Stats | Brentford | Age 26". Soccer Base. Retrieved 2014-03-03. ^ "Swindon swoop for striker McPhee". BBC. Retrieved 2015-07-07. ^ "Toumani DIAGOURAGA – Player Profile". Swindon-Town-FC.co.uk. Retrieved 2014-03-03. ^ Footymad Limited. "Millers complete Diagouraga swoop". Retrieved 27 November 2014. ^ "Rotherham United – Toumani Diagouraga". Rotherham.vitalfootball.co.uk. Retrieved 2014-03-03. ^ a b c "Toumani Diagouraga | Football Stats | Brentford | Season 2006/2007". Soccer Base. Retrieved 2014-03-03. ^ "Bulls capture young Watford pair". BBC. 2007-08-10. Retrieved 2015-07-07. ^ "Watford snap up Hereford Cup hero Ainsworth". Mail Online. Retrieved 27 November 2014. ^ a b c d "Toumani Diagouraga | Football Stats | Brentford | Season 2007/2008". Soccer Base. Retrieved 2014-03-03. ^ "Hereford United Home Page for the 2007-2008 season - Statto.com". Statto.com. Retrieved 2016-01-06. ^ "Bulls sign midfielder Diagouraga". BBC. 2008-07-08. Retrieved 2015-07-07. ^ a b c "Toumani Diagouraga | Football Stats | Brentford | Season 2008/2009". Soccer Base. Retrieved 2014-03-03. ^ a b "Posh sign midfielder Diagouraga". BBC Sport. 2009-06-17. Retrieved 2009-06-17. ^ a b c d e f "Games played by Toumani Diagouraga in 2009/2010". Soccerbase. Retrieved 11 April 2015. ^ "BBC SPORT | Football | League Cup | Blackburn 5–2 Peterborough". BBC News. 2009-10-27. Retrieved 2014-03-03. ^ a b "Peterborough's Toumani Diagouraga signs for Brentford". BBC Sport. 2010-01-21. Retrieved 2010-01-21. ^ "League One – Diagouraga extends Brentford loan – Yahoo! Eurosport". Uk.eurosport.yahoo.com. Archived from the original on 2015-07-08. Retrieved 2014-03-03. ^ "BBC Sport – Football – Norwich 1–0 Brentford". BBC News. 2010-01-23. Retrieved 2014-03-03. ^ "BBC Sport – Football – Brentford 4–0 Gillingham". BBC News. 2010-02-06. Retrieved 2014-03-03. ^ "Brentford sign Toumani Diagouraga from Peterborough". BBC Sport. British Broadcasting Corporation. Retrieved 16 July 2010. ^ a b "Toumani Diagouraga Player Profile – ESPN FC". www.espnfc.com. Retrieved 2015-07-07. ^ "BBC Sport – Football – Brentford 2–1 Charlton". BBC News. 2010-10-02. Retrieved 2014-03-03. ^ "Nicky Forster lands shot at Brentford manager's job | Mail Online". Dailymail.co.uk. 2011-03-02. Retrieved 2014-03-03. ^ "BBC Sport – Football – Brentford 0–1 Carlisle". bbc.co.uk. Retrieved 8 February 2015. ^ a b "Toumani Diagouraga | Football Stats | Brentford | Season 2010/2011". Soccer Base. Retrieved 2014-03-03. ^ Jacob Murtagh (2011-08-04). "Diagouraga gives Brentford injury boost". Get West London. Retrieved 2014-03-03. ^ "BBC Sport – Oldham 0–2 Brentford". Bbc.co.uk. 2011-09-24. Retrieved 2014-03-03. ^ "BBC Sport – Charlton v Brentford". Bbc.co.uk. Retrieved 2014-03-03. ^ "BBC Sport – Brentford v Bournemouth". Bbc.co.uk. 2011-11-08. Retrieved 2014-03-03. ^ "BBC Sport – Carlisle 2–2 Brentford". Bbc.co.uk. 2011-10-08. Retrieved 2014-03-03. ^ a b "Toumani Diagouraga | Football Stats | Brentford | Season 2011/2012". Soccer Base. Retrieved 2014-03-03. ^ a b "Toumani Diagouraga | Football Stats | Brentford | Season 2012/2013". Soccer Base. Retrieved 2014-03-03. ^ "Brentford 2–1 Notts County". BBC. Retrieved 2015-07-07. ^ "Bees star Diagouraga signs new contract". West London Sport. Retrieved 2014-03-03. ^ Chowdhury, Saj (2013-04-28). "BBC Sport – Brentford v Doncaster: League One's thrilling climax". Bbc.co.uk. Retrieved 2014-03-03. ^ "Toumani Diagouraga". espnfc.com. Retrieved 8 February 2015. ^ Jacob Murtagh (2014-01-21). "Brentford midfielder assured over future". Get West London. Retrieved 2014-03-03. ^ Jacob Murtagh (2014-02-06). "Bees boss plans to loan out fringe players". Get West London. Retrieved 2014-03-03. ^ Jacob Murtagh (2014-02-17). "Brentford midfielder agrees Portsmouth switch". Get West London. Retrieved 2014-03-03. ^ "BBC Sport – Scunthorpe United 5–1 Portsmouth". Bbc.co.uk. Retrieved 2014-03-03. ^ a b Murtagh, Jacob (2014-03-07). "Brentford to block Diagouraga bid". Get West London. Retrieved 2014-07-11. ^ Murtagh, Jacob (2014-03-12). "Portsmouth set to extend Diagouraga loan". Get West London. Retrieved 2014-07-11. ^ "BBC Sport – Fleetwood Town 3–1 Portsmouth". Bbc.co.uk. 2014-03-15. Retrieved 2014-07-11. ^ "Calm And Collected". Portsmouthfc.co.uk. 2014-03-15. Retrieved 2014-07-11. ^ "Toumani: I Want To Stay". Portsmouthfc.co.uk. 2014-03-15. Retrieved 2014-07-11. ^ "Brentford star Diagouraga extends loan spell at Portsmouth". talkSPORT. Retrieved 2014-07-11. ^ "Toumani Diagouraga Back From Portsmouth". Brentfordfc.co.uk. Retrieved 2014-07-11. ^ "BBC Sport – Oldham Athletic 0–0 Brentford". Bbc.co.uk. 2014-03-29. Retrieved 2014-07-11. ^ "BBC Sport – Brentford 1–0 Preston North End". Bbc.co.uk. 2014-04-18. Retrieved 2014-07-11. ^ a b c d "Toumani Diagouraga | Football Stats | Brentford | Season 2013/2014". Soccer Base. Retrieved 2014-03-03. ^ "Toumani Diagouraga Player Profile – ESPN FC". www.espnfc.com. Retrieved 2016-01-06. ^ "Brentford star must earn new deal, says boss". ^ Jacob Murtagh (9 December 2014). "Toumani Diagouraga pens new Brentford deal". getwestlondon. Retrieved 8 February 2015. ^ Chris Wickham. "Match report from Leeds United v Brentford in Sky Bet Championship at Elland Road". brentfordfc.co.uk. Retrieved 8 February 2015. ^ a b Chris Wickham. "Prizes handed out at Brentford FC Player of the Season Awards Dinner". brentfordfc.co.uk. Retrieved 14 June 2015. ^ a b "Games played by Toumani Diagouraga in 2014/2015". Soccerbase. Retrieved 11 April 2015. ^ Paul Gilbert (11 January 2016). "Brentford 'reject' transfer request from Toumani Diagouraga". Sky Sports. Retrieved 11 January 2016. ^ a b Wickham, Chris. "Toumani Diagouraga signs for Leeds United". www.brentfordfc.co.uk. Retrieved 2016-01-25. ^ "REPORT: CARAYOL SECURES BRENTFORD POINT". Leeds United. 26 January 2016. ^ Leeds United Official Site (30 January 2016). "REPORT: UNITED SEAL CUP PROGRESS AT BOLTON". Leeds United Official Site. Retrieved 30 January 2016. ^ "Leeds United 2 Wolves 1: Bamba stunner sets Whites up for third-straight win". Yorkshire Evening Post. 19 April 2016. Retrieved 19 April 2016. ^ a b "Toumani Diagouraga | Football Stats | Brentford | Season 2015/2016 | Soccer Base". www.soccerbase.com. Retrieved 2015-08-11. This page was last modified on 29 September 2016, at 23:04.